The drama just gets better with each episode. The new episode would always be better than the previous, and it’s hard to choose my favourite. If they are being judged from the ability of making the viewers cry, I would say that this is the episode that can make me shed my tears almost effortlessly. Congratulations for being the most touching episode so far, episode 14. 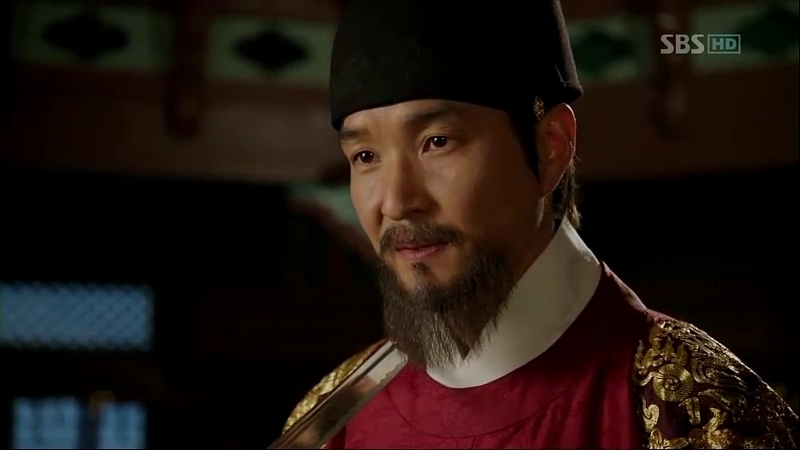 Chae-Yoon walks into the room, moving closer to the throne. 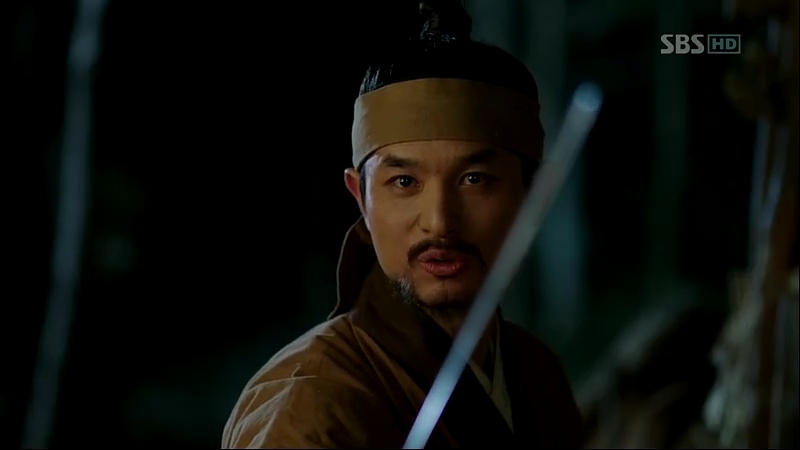 After getting the confirmation from Sejong about his permission for him to continue his revenge, he draws out his sword. Sejong doesn’t even flinch and he rises from his position, walking towards Chae-Yoon and eventually closing the distance between them. Moo Hyul follows him cautiously, ready to face any situation that might arise from there. Without any delay, he strikes, only to be blocked by Moo Hyul’s sword. 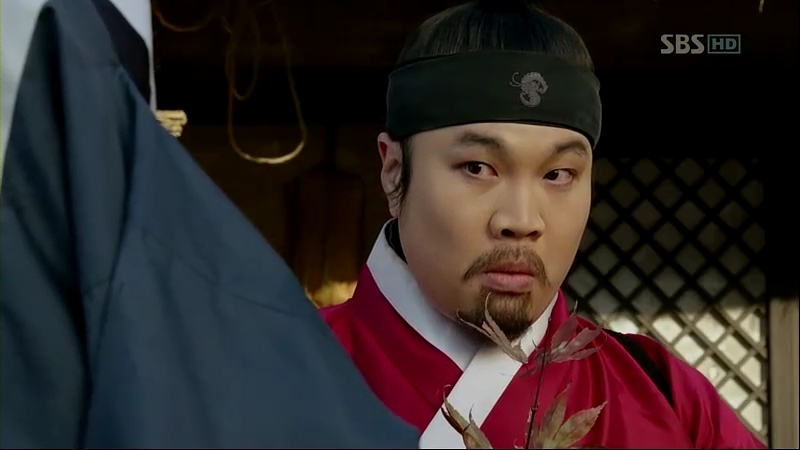 Despite Sejong’s order to retreat, Moo Hyul refuses to do so. 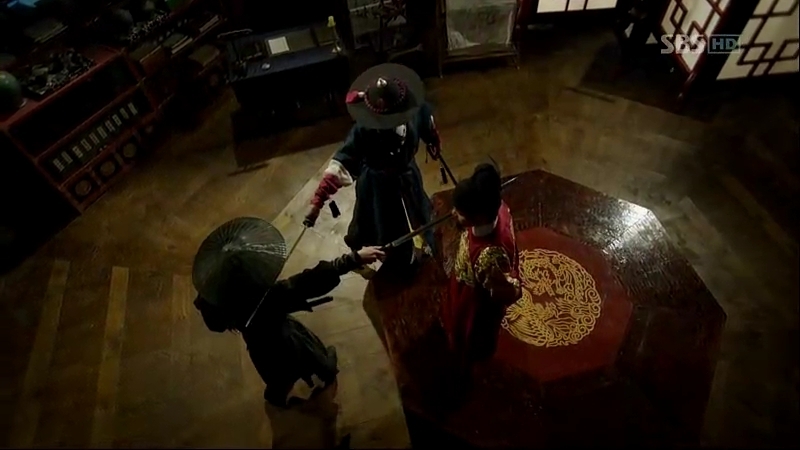 Sejong moves closer to his sword, but Chae-Yoon moves backwards. Sejong knows he isn’t going to kill him, but he’s only there to kill himself. Chae-Yoon pulls his swords towards his throat to end his life, but Moo Hyul is faster to block him and pushes him away onto the floor. Sejong chides him with his usual curse, saying that it’s because of a great teacher of him who also loves cursing. 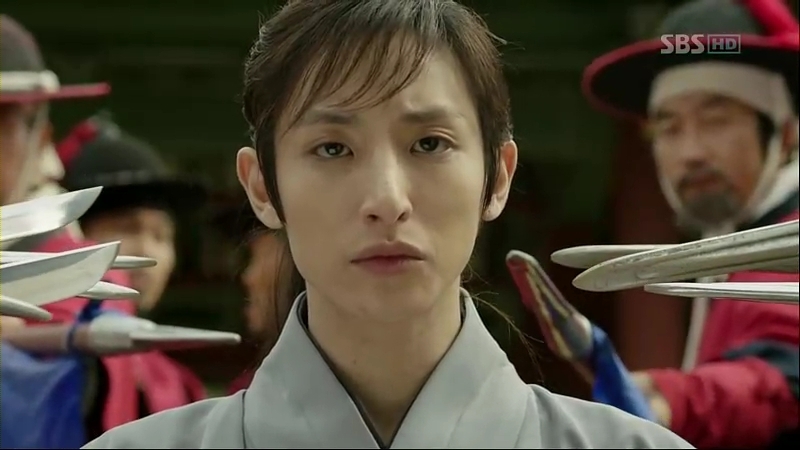 Other members of Mil-Bon have also known about Chae-Yoon’s real identity, and they somehow establish the connection that he might have with Sejong based on what Moo Hyul said when he sent Ddol-Bok to Dam-Daek. 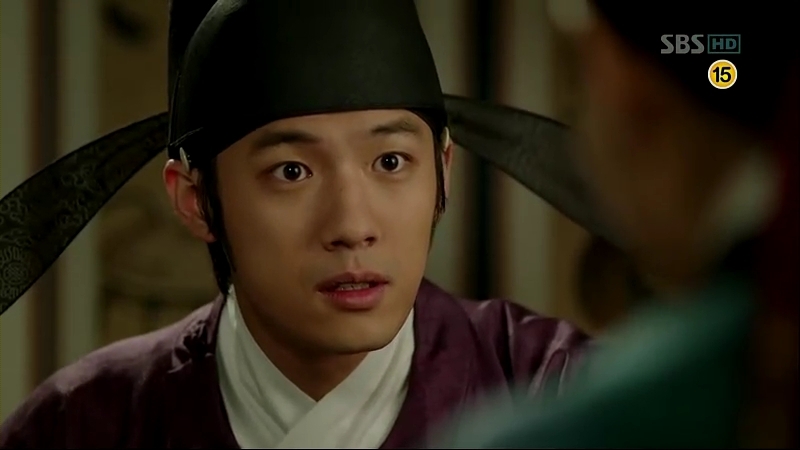 Sejong tells him the truth about him saving Chae-Yoon, per Chae-Yoon’s demand to know the reason why he’s doing this. The night that made both of them living in hell, the night Sejong started to be himself: Yi-Do. He expresses his intention of making Chae-Yoon judge his writing and alphabets. 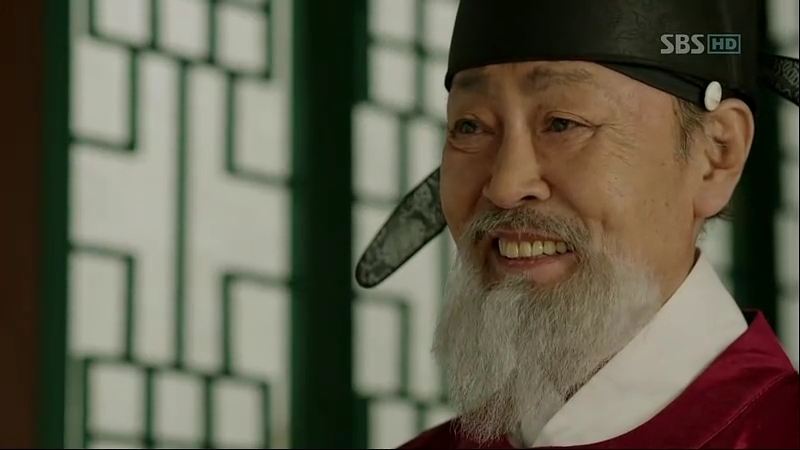 Chae-Yoon laughs in sinister, saying that knowing the alphabets won’t change anything in the commoners’ lives. Sejong is sure his alphabets aren’t going to deceive his people and would provide a better life for them, in which Chae-Yoon believe will not be more than a beautiful dream for the commoners. Quoting his father’s will, his father didn’t even ask him to avenge his death, but told him to learn how to write so that he won’t end up like him. Sejong turns his back on Chae-Yoon, unable to face him. He gives his final words to Sejong before leaving: he’s not going to kill Sejong because of his father and Dam-Yi’s pure heart that beat him and it has nothing to do with Sejong’s great cause. He admits his loss to both of them, and leaves despite Sejong’s plead to fight with his alphabets. So-Yi tries to make him stay but also fails. 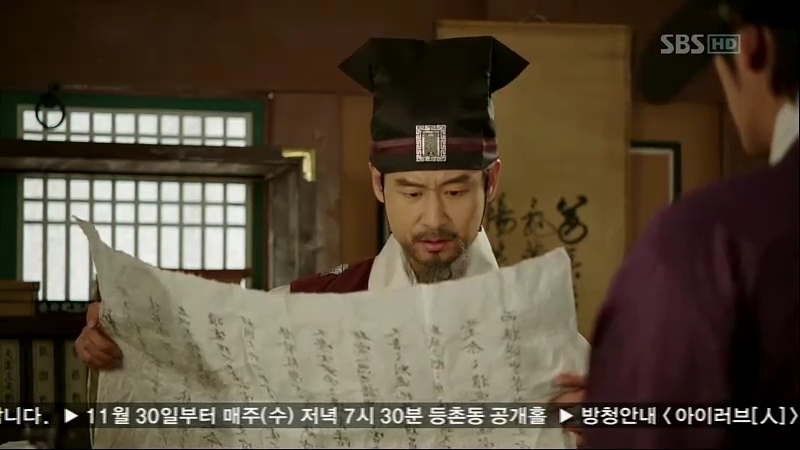 At the Banchon, Mil-Bon are thinking hard whether Chae-Yoon knows what the king is working on, but based on his notes (secretly copied by Ki-Joon), they conclude that he doesn’t have any clue about it. Ki-Joon senses something weird about the ‘Goon Na Mi Yok’ phrase that Chae-Yoon found but didn’t report, and Han comes, bearing other clues that they have in their hand so far. He concludes that those clues have something in common. They are all against the practice of Confucianism. Suddenly, a letter arrives. Minister Lee wants to meet Ki-Joon. Jeong Ki-Joon goes to Minister Lee’s residence and Scholar Hye Gang is also there. Minister Lee wants to offer something as a proof of allegiance to Mil-Bon. He shows a mold of printing block made by Scholar Yoon Pil. Ki-Joon rewrites the character on the mold and something clicks in his mind. 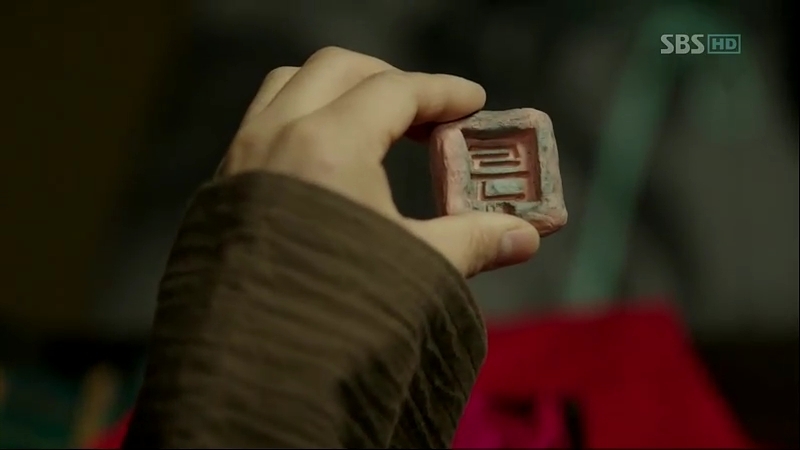 He brings it back, where Han and Scholar Shim recognize some familiar Chinese characters in the mold. Ki-Joon puts two and two together, and he finally solves what Sejong is working on: alphabets. He laughs at Sejong’s foolish attempt to produce something that will be opposed by people practicing Confucius teachings. He decides to begin his plan, first putting Jip-Hyun Jeon in the officials’ bad book. 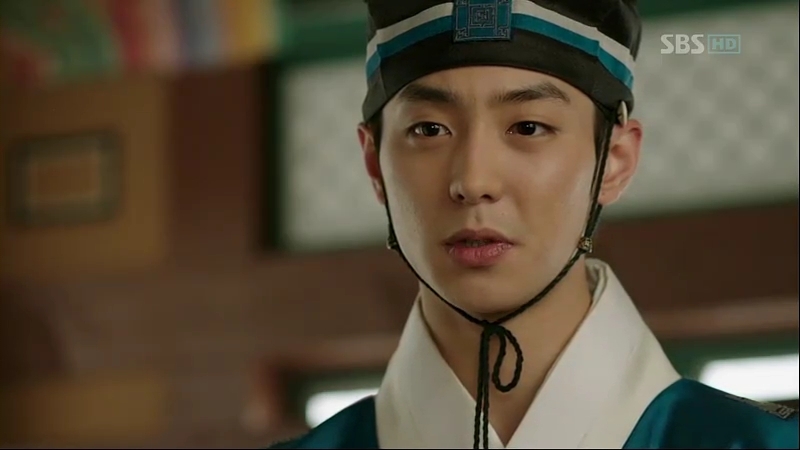 Sejong is still upset with Chae-Yoon refusal, but Moo Hyul cheers him up, telling him that he has done his best in persuading him. So-Yi can’t hold her tears and walks away. Despite their frequent arguments with each other, Park Po and Cho-Tak is working together while wondering where Chae-Yoon has gone to. Suddenly, Park Po recognizes Pyeong, who’s walking around the city. They run after him. 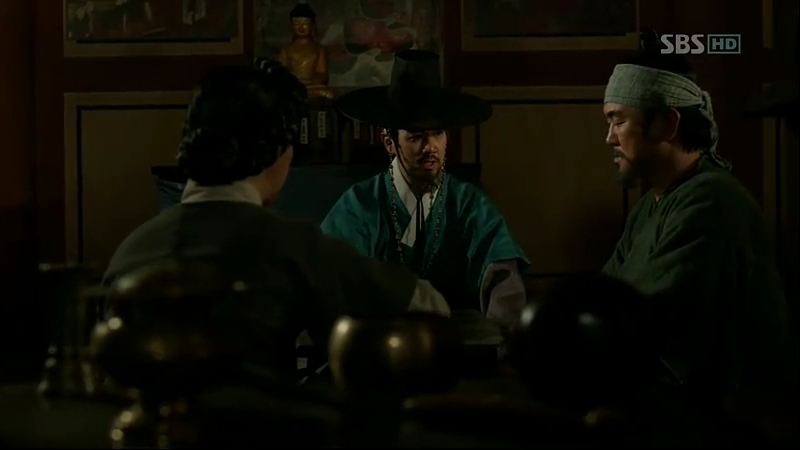 The officials are discussing about Sejong’s movements around the palace. Everyone gives a disapproving look at Minister Jeong, who doesn’t say anything about his frequent meetings with Sejong. Cho-Tak and Park Po chase Pyeong and follow him into the Investigation Bureau, where he submits himself and confesses about his crime of murdering the scholars. The two guards are in complete shock to witness this. Sejong decides to do the promulgation of the alphabets surprisingly to the public. He trails off his words in the middle when he looks at So-Yi. He also discloses about Mil-Bon letter to them but he’s interrupted by someone in the middle. Minister Jang interrupts the officials’ discussion to call Minister Lee to the Investigation Bureau. Pyeong is being interrogated by Minister Lee himself and Ki-Joon is also present to identify the evidence. When he’s asked about his reason to commit such a crime, he just states that they’ll find the reason very soon. At the same time, a notice is brought over by a guard; the same notice is being distributed around the city. The notice describes perfectly about Cheonji and proofs that show the king is trying to do something in secret that has broken the common law. It also includes Seong Sam-Moon’s name as an identified Cheonji member with a tattoo on his body. The notice lastly reveals what Sejong has been working on: alphabets. 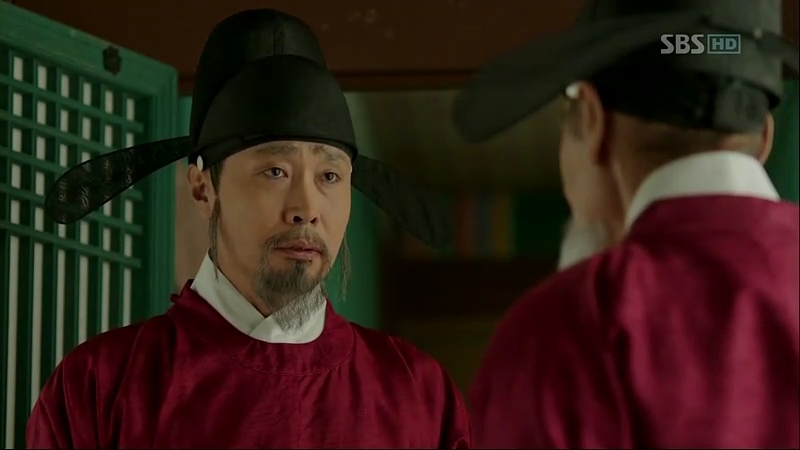 Sejong’s team is stunned upon this revelation, while Sam-Moon is immediately arrested by his fellow Jip-Hyun Jeon scholars and his tattoo confirms the claim. He refuses to disclose anything to Scholar Choi and Scholar Shim. 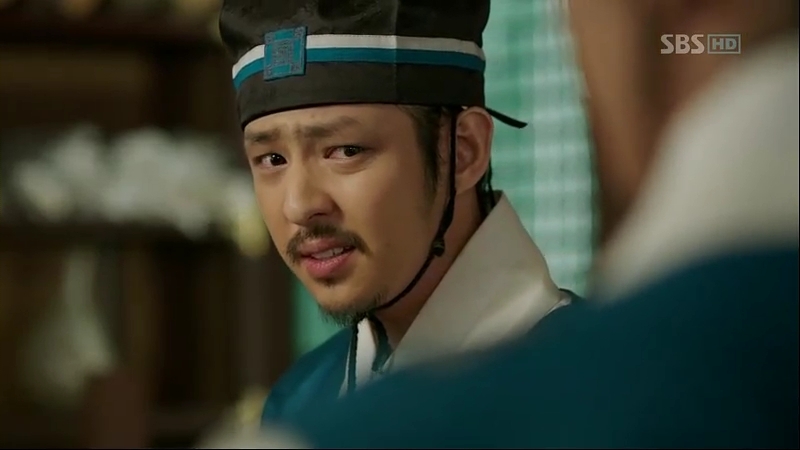 To avoid further problems, he’s ordered to leave the palace with Paeng-Nyeon. The officials are not going to let go of this matter easily and decide to ask Sejong personally. Everything that Ki-Joon planned before is running smoothly, thanks to the Mil-Bon inside the palace. The officials demand Sejong to make his secret room public while Sam-Moon is being inquired to be investigated. Scholar Choi tries to dig the details from Minister Jeong. He doesn’t want Joseon to be a barbaric country using its own writing system and alphabets. 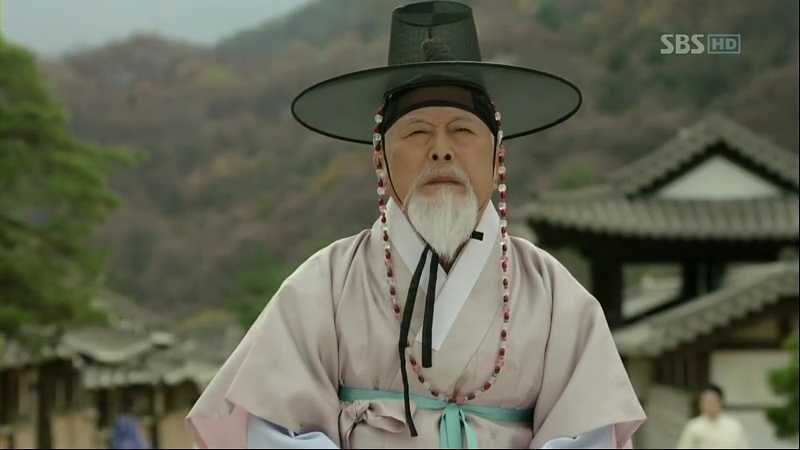 Next, Scholar Hye Gang kneels outside the palace gate, demanding to know the truth. As he’s a respectable figure, he’s already attracting people’s attention. Sejong suspects someone is behind all this. As the suspicion around his Gyungsungjeon is arising, Sejong decides it’s the time for them to move their proofs of making the letters away that night. Prime Minister meets Sejong, and he clearly knows what Sejong has been doing all this time but he doesn’t tell anything to other officials. He suggests that Sejong halts his projects temporarily and shows what he should show to everyone. Outside, Minister Jo overhears and he faces Prime Minister to confirm it. 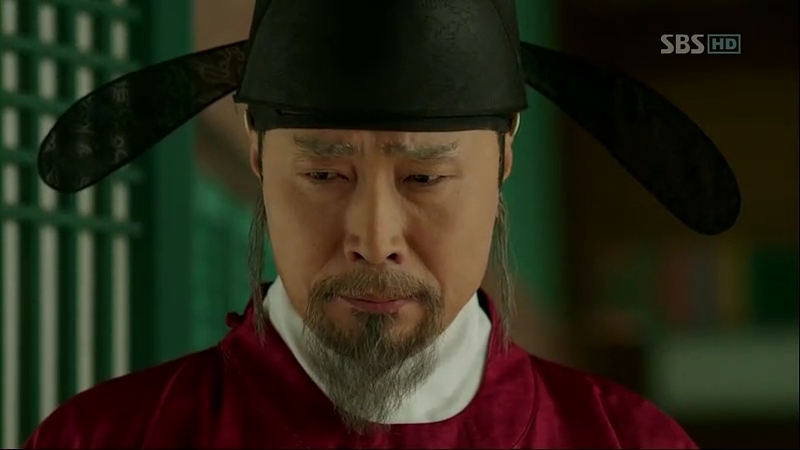 He’s in conflict whether to support or to oppose what the king is doing as Taejong only ordered him to get rid of Mil-Bon. Chae-Yoon is alone. He calls for his father, offering him a drink. He pours it for him, but nothing happens when he asks for his father to pour him one. He goes to the waterfall, where he once went with his father. He starts to cry, and a hand holds his nose, asking him to blow his nose. He looks at his side to find his father chiding him for crying like a baby. He reaches for his hands, glad to find him there. Dam-Yi’s father is also there, gulping the drink to his heart’s content. He tells Chae-Yoon to just cry. 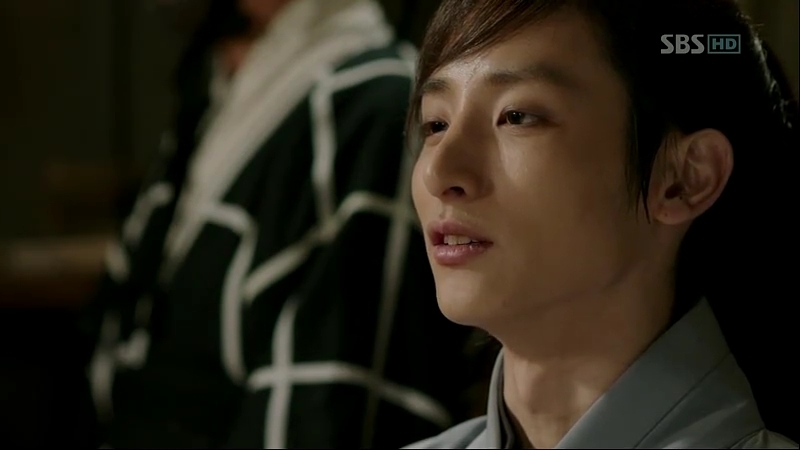 He and Chae-Yoon’s father start to argue about Dam-Yi while Chae-Yoon laughs between his tears. Dam-Yi’s father pours him the drink before dancing around while singing. Chae-Yoon’s father joins him. Chae-Yoon happily looks over the two men but when he wants to join them, they disappears from him sight. The empty cup is now full, much to his surprise. He empties the cup and decides to end his revenge. He says his goodbye to Ddol-Bok, whom he liked to treat as a history. 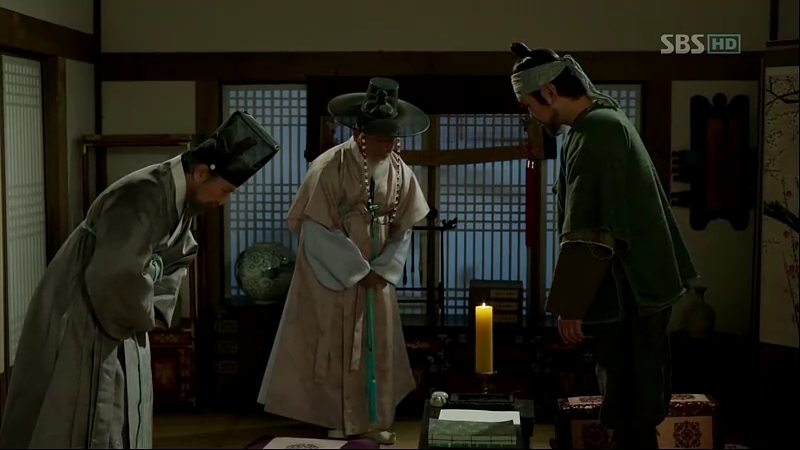 More scholars are kneeling in front of the palace, following Scholar Hye Gang’s step. Chae-Yoon passes by, but he doesn’t give much atten tio to it and walks away. Cho-Tak and Park Po is still worried about Chae-Yoon and they are just starting to fight when Chae-Yoon appears. He teases them and with teary eyes, they hug him. They are surprised when Chae-Yoon doesn’t show much interest when they tell him about Pyeong’s arrest. They head over to the tavern for a meal, where they are joined by the owner lady, the little girl, and the sound-maker guy. Their conversation is mainly about the current issue of the gossip about the king making a new writing system. Both Cho-Tak and Park Po both oppose the idea. Chae-Yoon asks why they thought so, and Cho-Tak thinks it’s not an easy thing for people like them to learn something new. Chae-Yoon listens to their conversation attentively and others also don’t think they would learn those writings and alphabets, except for the little girl. She wants to learn in order to write her friend’s name, which can’t be written using Chinese characters. Park Po is surprised when Chae-Yoon keeps asking about the price of rice and paddy field. He thinks Chae-Yoon has someone in his heart, but he says he’s only planning for his future. Suddenly, Chae-Yoon sees So-Yi coming, so he hides and tells Park Po to say he isn’t there. Park Po laughs, thinking that it’s impossible for her to come looking for him. However, he’s surprised when she comes and asks for Chae-Yoon. She passes a letter to him before she leaves. Behind the door, Chae-Yoon’s eyes follow So-Yi’s steps, hoping that she will continue her life as So-Yi. Mil-Bon receives the news about Sejong going to make Gyungsungjeon public the next day, and Ki-Joon knows Sejong and his people will be moving the evidence of alphabets making on that night. 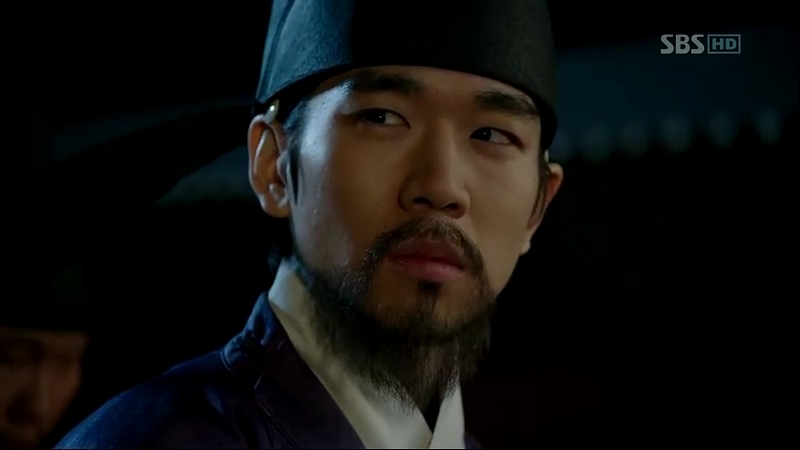 Their people inside the palace have been alerted, and Scholar Shim is watching any movements closely. Inside the Gyungsungjeon, Sejong is busy mixing up the papers about the alphabets assisted by the court ladies. So-Yi is to rearrange them once she arrives at the temple as she has memorized it. 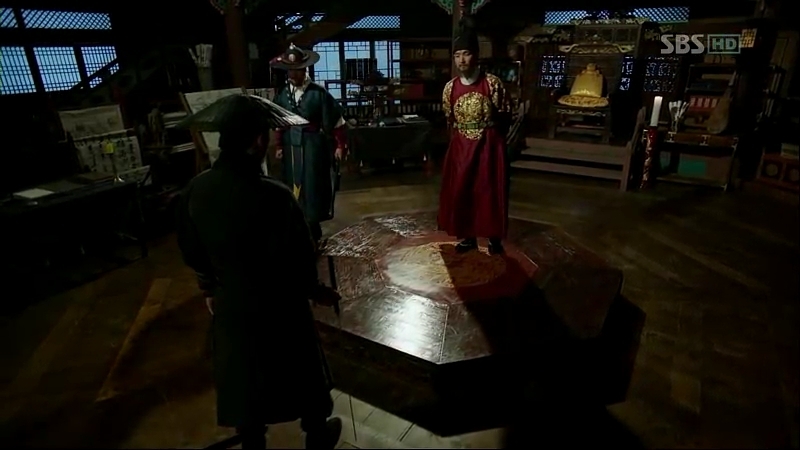 Prince Gwangpyeong comes in to inform Sejong about the two palanquins he has prepared. The palanquins’ movement towards Gyungsungjeon is seen by Minister Jang and his suspicion can’t be chased away. He informs it to Scholar Shim, who admits that it is a strange happening and the king might be moving the evidence using those palanquin. Sejong divides the task and off they go according to what has been planned, while Scholar Shim and the Mil-Bon soldiers are watching them closely. Chae-Yoon reads So-Yi’s letter. She wants to meet him in front of the Paper Office before dawn. He doesn’t want to meet her, afraid of cancelling his intention to leave. After a round of murmuring to himself, he leaves his house, not forgetting to leave letters to both Park Po and Cho-Tak. The Mil-Bon soldiers quickly run away with the palanquins, following the plan by Prince Gwangpyeong and So-Yi. Mil-Bon is upset to find nothing inside the palanquins but Scholar Shim has gotten the info about odd amount of paper that is going to be discarded from the Paper Office. He thinks that the evidence is there. In front of the office, So-Yi and Prince Gwangpyeong are getting ready, all relieved as their plan works. 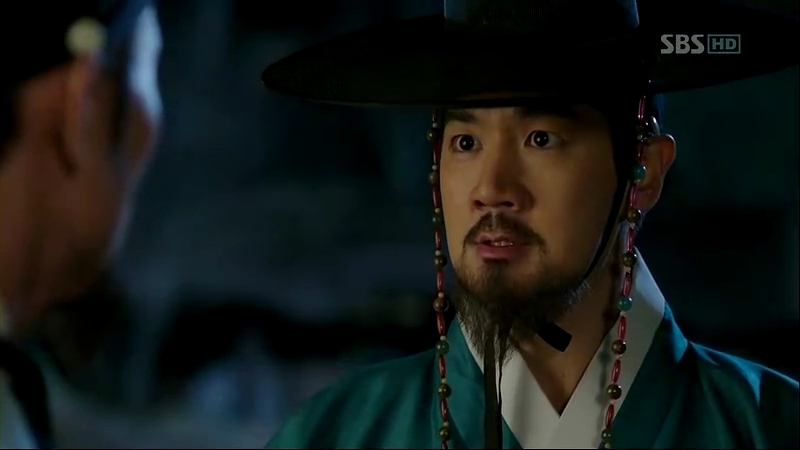 Unknown to them, Chae-Yoon comes to have his last look at So-Yi, who’s looking around for him. He leaves and passes by a group of men with a cart but ignores them. The men with the cart turn out to be the Mil-Bon soldiers, and they attack So-Yi and Prince Gwangpyeong. 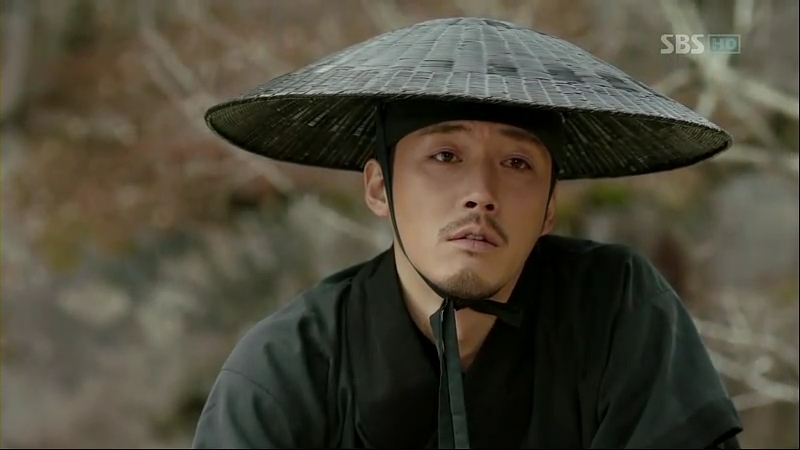 Chae-Yoon hears the commotion, but he tries his best to ignore it. At last, he finds something is wrong and turns back. The palace slaves have died and no one else is there. Inside the carriage, So-Yi and Prince Gwangpyeong, who is injured, are there, together with the evidence paper. Their journey is stopped by a man. The Mil-Bon soldiers ask him who he is. He warns them to leave before he kills them one by one. He introduces himself: Hanjitgol Village’s Ddol-Bok. I don’t know how many times I cry when I watch this episode. Even re-watching it while doing my recap still makes my eyes wet. 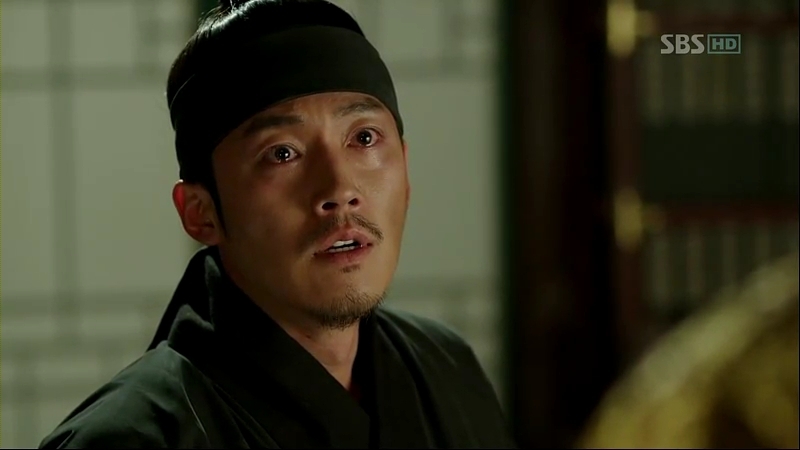 *sigh* Hands down, Jang Hyuk should get an award for his role here. Gosh, this scene literally breaks my little heart. A perfect scene for our poor Ddol-Bok. Seeing his father there, trying to make him blow his nose just makes the tears flow. The natural acts of the two fathers, Chae-Yoon’s mixed happiness and sadness, and the place are blended into this emotional scene. But the most heartbreaking moment is when they disappear from his sight, leaving him alone with the full cup beside him. I’m actually glad they ‘return’ to him even for the shortest time, and makes Chae-Yoon decides to move on. Ahhh…hopefully he won’t be sad anymore after this! I don’t want to comment about Mil-Bon, although they are only getting my hate for their actions, which at times seems so ridiculous to me. Plus, the fact that some ministers that I thought to be on Sejong’s side turn out to be the silent villains makes me resent them so much. Luckily, there are still some officials that will probably be on the good side. 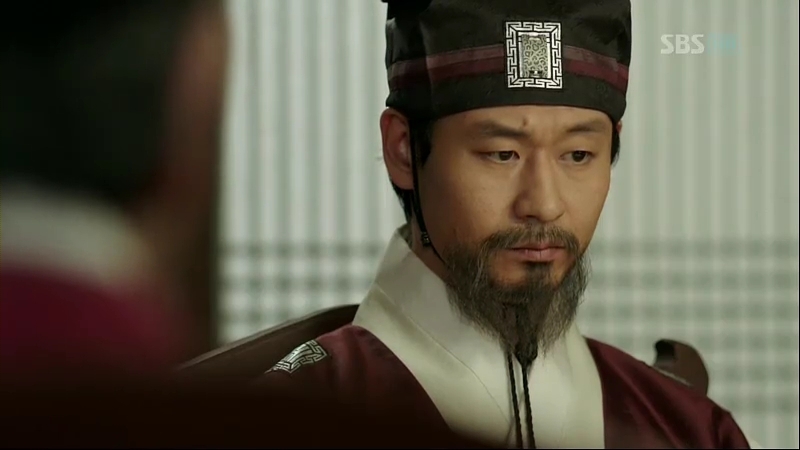 I didn’t really like Minister Jo in the beginning, probably because he was Taejong’s most trusted man. I thought he would be the bad person, but when he starts working on the case with Chae-Yoon (although he’s at first aiming for Mil-Bon, but I’m okay with that), I start to like him. 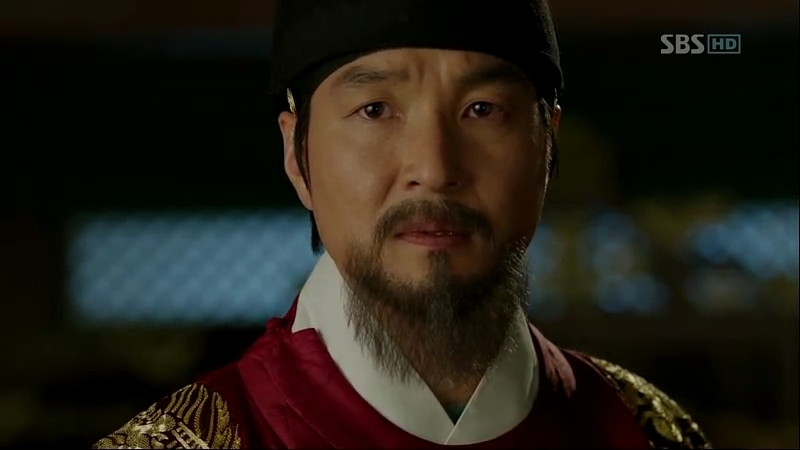 I do hope he will support Sejong, as he’s someone who will be loyal to his king. And the Prime Minister? I never thought he would be so cool like that. He’s not that vocal in the officials’ meetings, but he’s someone who’s loyal to Sejong. Hopefully, they will be the strong supporters to Sejong despite the severe objections from other officials. Being the shallow person I am, I want the Mil-Bon to be sentenced or something, but I don’t want Pyeong to be sent away like Sam-Moon and Paeng-Nyeon! Oh, maybe they will appear less in the coming episodes..and please don’t kill off the Prince so soon!